the Lower East Side, lies a massive, unused space nearly the size of Gramercy Park. This project envisions using an advanced solar technology to channel sunlight underground, enabling plants and trees to grow. 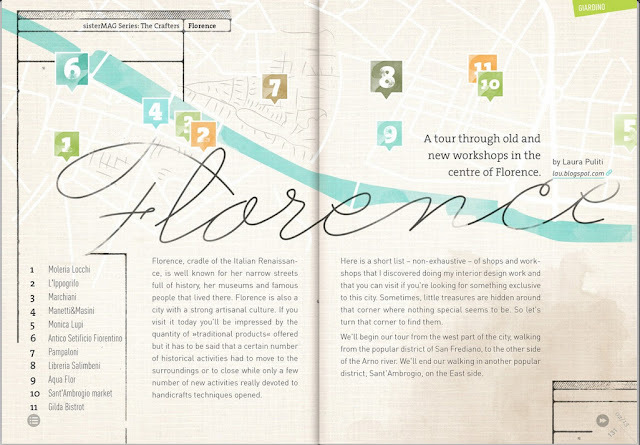 Envisioned and designed by RAAD Studio. More. 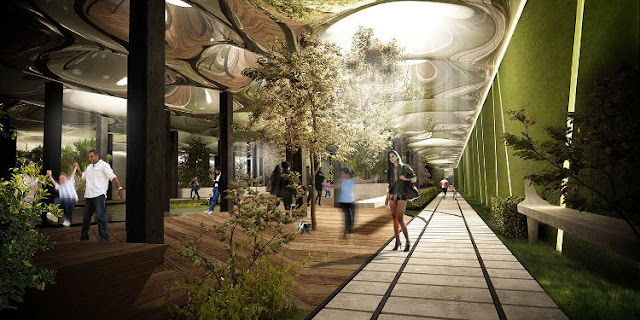 "The Lowline is a plan to use innovative solar technology to illuminate an historic trolley terminal on the Lower East Side of New York City. Our vision is a stunning underground park, providing a beautiful respite and a cultural attraction in one of the world’s most dense, exciting urban environments. The proposed location is the one-acre former Williamsburg Bridge Trolley Terminal, just below Delancey Street on the Lower East Side of Manhattan. The site was opened in 1908 for trolley passengers, but has been unused since 1948 when trolley service was discontinued. Despite six decades of neglect, the space still retains some incredible features, like remnant cobblestones, crisscrossing rail tracks and vaulted ceilings. 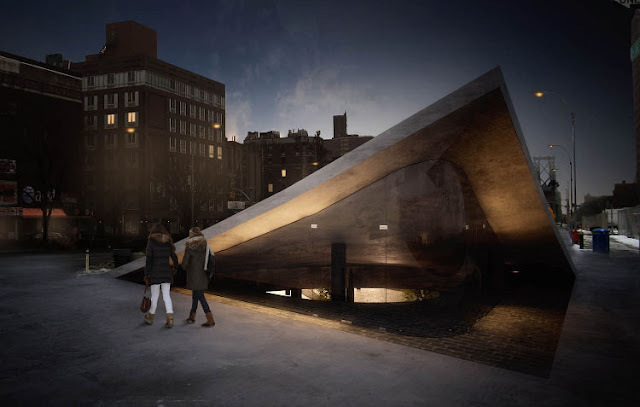 It is also directly adjacent to the existing JMZ subway track at the Essex Street subway stop– so park visitors and subway riders would interact daily. This hidden historic site is located in one of the least green areas of New York City— presenting a unique opportunity to reclaim unused space for public good. Designed by James Ramsey of Raad Studio, the proposed solar technology involves the creation of a “remote skylight.” In this approach, sunlight passes through a glass shield above the parabolic collector, and is reflected and gathered at one focal point, and directed underground. Sunlight is transmitted onto a reflective surface on the distributor dish underground, transmitting that sunlight into the space. This technology would transmit the necessary wavelengths of light to support photosynthesis, enabling plants and trees to grow. During periods of sunlight, electricity would not be necessary to light the space. 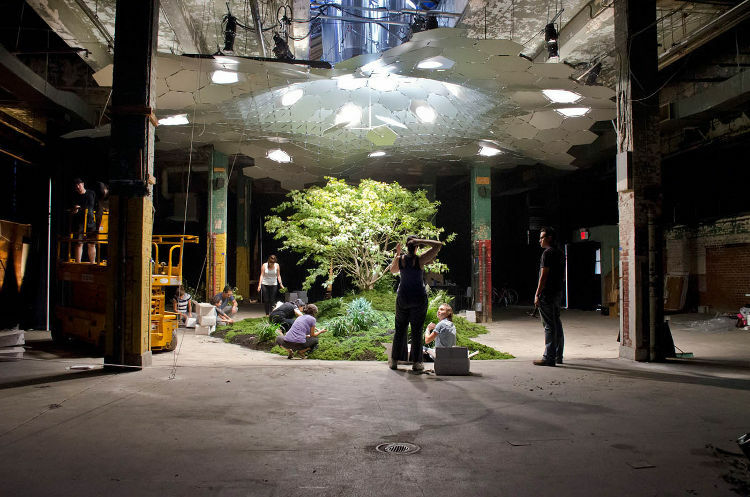 In September 2012, the Lowline team built a full scale prototype of the technology in an abandoned warehouse in the Lower East Side, for the “Imagining the Lowline” exhibit. The exhibit attracted thousands of visitors, was heavily covered by the press and ultimately served as a proof of concept. We are inspired to use technology to improve the lives of city residents, by creating more of the green space we all need. 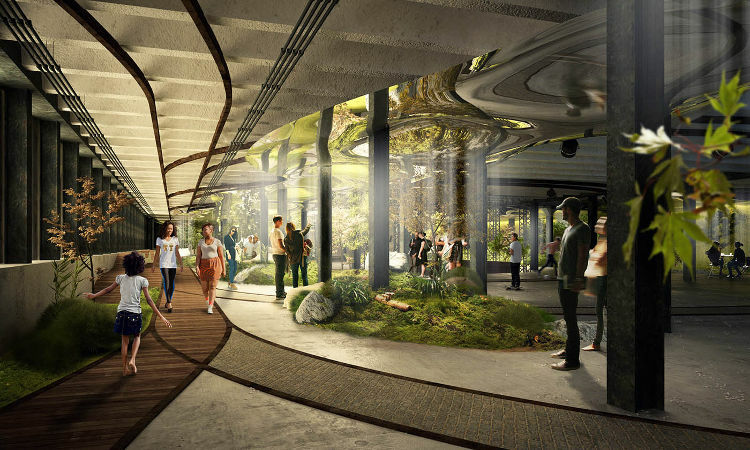 The Lowline aims to build a new kind of public space— one that highlights the historic elements of a former trolley terminal while introducing cutting-edge solar technology and design, enabling plants and trees to grow underground. To explore our vision in greater detail, we commissioned a preliminary planning study with Arup, the global engineering firm, and HR&A Advisors, a leading real estate, economic development and energy-efficiency consulting firm. The study concluded that the Lowline was not merely technically feasible, but would also vastly improve the local economy and the adjacent transit hub. Once built, the Lowline would be a dynamic cultural space, featuring a diversity of community programming and youth activities. We envision not merely a new public space, but an innovative display of how technology can transform our cities in the 21st century. And along the way, we intend to draw the community into the design process itself, empowering a new generation of Lower East Siders to help build a new bright spot in our dense urban environment."